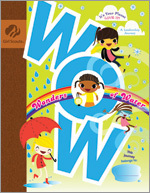 This journey, meant for second and third graders, follows friends Alejandra, Campbell, Jamilla, and Brownie Elf as they explore and enjoy some of the amazing wonders of water. Girls will learn about the endless cycle of water and will have a good time making their own rainbows as they explore our precious water resources. They'll meet inspiring women who are working to preserve and protect our water supply and learn about Girl Scout history, and, as a team, come to understand that "WOW" also stands for Ways of Working. The girls will reach out to their community as they advocate for other people to get involved in protecting water, too! This book is imported. The Brownie friends and Brownie ELF enjoy some wonder-filled adventures as they invite the real-life Brownies to explore the Wonders of Water. As they dive in, the Brownies realize they can create another big WOW as they try out new Ways of Working as a team. Brownies learn about the water cycle through a "Green Tea for the Blue Planet," and enjoy making their own rainbows as they explore the precious resource of water. Brownies pledge to LOVE water by protecting it, then team up to advocate for other people to SAVE water, too. As they SHARE what they have learned, they find they can inspire even more people to protect Earth's water. Along the way, Brownies experience what it is like to live in places where there is not enough water. They come to understand why the right to clean water is so important to everyone on Earth. Along the journey, the Brownies earn their LOVE Water, SAVE Water, and SHARE Water awards. As they celebrate their leadership accomplishments, they add the WOW! award to their vests, too! The WOW! journey presents Brownies the opportunity to earn four awards. Girls begin with small, personal acts and then move out to purposeful teamwork that engages the larger community and influences its members in significant ways. LOVE Water - This first award encourages girls to become aware of the many ways they use and enjoy water. As they begin to understand the science of water and its importance in the world, they will also make a personal commitment to protect it. SAVE Water - The second award is earned when the Brownies team up and speak up as advocates to protect water or keep it clean in their community. Girls start thinking as a team about what they will do for water. By making an effort that moves beyond themselves, the girls begin to realize the impact that group efforts can produce. SHARE Water - Girls earn the third award as they create an even bigger ripple by sharing their efforts for water with others, educating and inspiring them to join in, and asking them to commit to a water promise. WOW! - Girls culminate their journey by earning the WOW! Award, a grand finale that symbolizes the powerful change they've brought to their community. They earn the award by showing proof of their SHARE Water efforts, and by describing how their efforts relate to the Girl Scout Law and how they have had an impact as leaders.